Slide encoder onto shaft. To keep encoder from rotating: have a pin to prevent rotation in one of the mounting holes, or a bracket bolted onto the mounting holes, or simply tie wrap the cable. 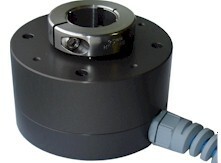 Whatever is done, ensure there is a bit of play between encoder and mounting arrangement to prevent bearing damage. Hook up the encoder with the connections as described. Make sure power supply meets specifications.